A lost, laughin’ & lovin’ it group! Do you have a group of people that would LOVE to all get together & challenge the evening maze??? For example: family reunions, scouts, co-worker’s, camps, birthday parties, girls night out, couple’s night out, alright…even guy’s night out, employee appreciation, 4-H members, church groups…….you get the idea! So if you have a group like this, we can reserve any night of the week (except Saturday’s & Tuesday’s) for a Private Party in the Maze! It just means your group of people will be the only ones in the Maze, you’ll have it all to yourselves! Well, not all to yourselves … we’ll be there too! 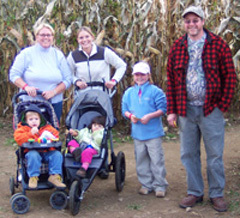 We can even customize your party to include everything from visiting the Livestock Barn, having a wagonride, picking some pumpkins (in season), &, of course, challenging the maze. Prices vary depending on how many or how few activities you’d like to include as well as the number of people in your party. Please contact us for details, pricing & availability of your date for you’re A-MAZE-ING group! We are really excited to offer our Special Event for your get-together! Please see our Hours and Rates page for current rates.